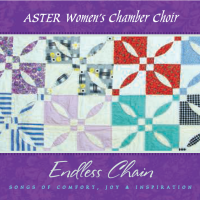 ASTER Women's Chamber Choir · Our First CD! ASTER is pleased to announce the release of our first CD, Endless Chain. This recording represents the endless chain of music handed down from one generation to the next, and how thankful we are for the many singers and musicians who have given of their time and talent to make this vision a reality. It is ASTER’s hope that we will be able to spread this music all across the country to people who would never be able to attend our concerts, as well as sharing it with our loyal fans here in Colorado. Learn more, listen to samples, order your copy!